How do I get access to my CLASSIC EPISODE rewards? How do I get access to my NEW EPISODE rewards? When I try to use my code, it says it's already been used! What do I do? I redeemed my code but don't see the episodes on VHX! What do I do? For a lot of you, the most anticipated digital reward will be the CLASSIC BONUS EPISODES, which we're distributing through a platform called VHX. The first time you want to access your episodes, you'll need to start by REDEEMING your unique access code, so that the episodes can be added to your personal VHX episode library. To do that, you'll need to copy-and-paste the unique URL for "Classic Bonus Episodes" from your digital rewards on BackerKit into a new browser window. If you already have a VHX account, be sure to use the same email address you've used before, so that all of your digital episodes will be connected to the same account! If you've never used VHX before, just choose an email address that will be linked to your episodes, so enter it into the box! Once you press REDEEM NOW, you'll be able to start watching immediately, and you should also receive an email with a link to access your episodes ANY TIME. Be sure to save that email – it'll make them easier to watch again later! Once you have an account, you'll be able to stream and download your episodes, DRM-free, whenever you want. You can also download the VHX app for Apple TV, ROKU, iOS, Android, and many other popular devices, which will make it easy to stream the episodes whenever you want, even without downloading them. If you pledged for KICKSTARTER EXPERIMENT 035 or higher, you now have permanent access to stream and download the first new episode of Season 11 – Experiment 1101: Reptilicus – whenever you want! And if you pledged for KICKSTARTER EXPERIMENT 085 or higher, you now have permanent access to stream and download all 14 episodes of Season 11 whenever you want! To start watching your episodes, you'll first need to redeem your UNIQUE ACCESS CODE. If you've never used VHX before, just choose an email address that you'll link to your episodes, and enter it into the box! 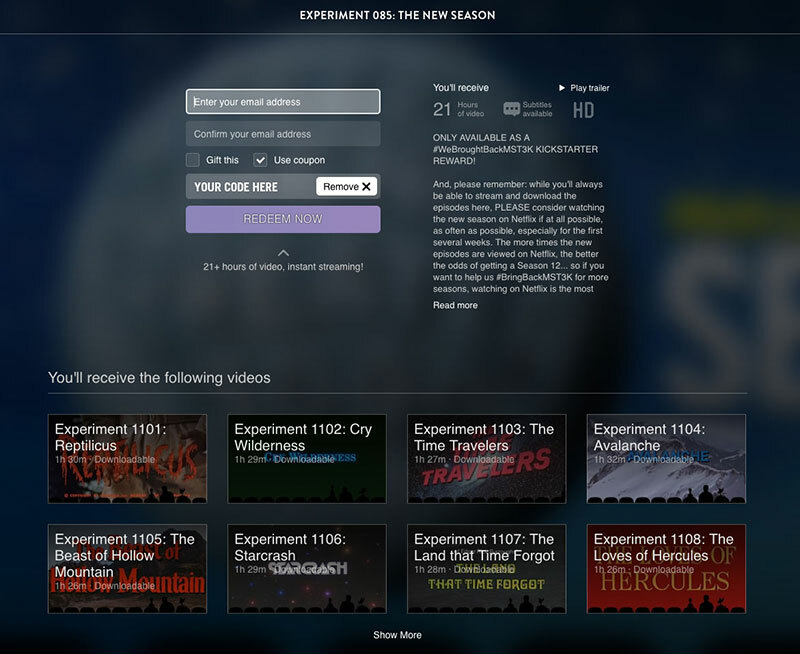 You should also receive an email with a link to access your episodes ANY TIME. Be sure to save that email – it'll make them easier to watch again later! And now, you can start downloading or streaming your new episode(s)! My code says it has already been used! What now? If your code says that it has already been redeemed, or asks you to put in a credit card number and pay $999,999.99, DON'T PANIC! You've already redeemed the code in the past, and don't need to do it again. You're using the wrong code by accident. Either way, do your best to stay calm. We'll get it fixed! First, try going to your VHX LIBRARY and see if the episodes are there. If that doesn't work, email kickstarter@mst3k.com and tell us what's happening. We'll do our best to get your problem fixed as quickly as possible, so you can start watching. I redeemed my code but I don't see the episodes. How do I watch the episodes? Once you've redeemed your VHX access code, your episode rewards will always be waiting in your library for download and/or streaming. You can find them at any time by returning to your VHX LIBRARY.